I have been making Spirit Jars since 2008, but decided in 2011 I would start a new series, small containers for folks to keep treasured items. These jars average 5″ in diameter x 3.5″ in height which varies slightly depending what sculptural figure I attach to the lid. Most are mixed media, meaning I add found items such as glass beads, ceramic beads, faux or real fur, found feathers, cord, leather or horse hair. I may repeat a theme, yet each figure is hand formed so there will be many variations. When I travel I enjoy seeing the geodes, gems, and petrified wood that various rock stores carry. I started a collection quite a number of years ago. Now I find I want to share them by using them in my raku. On this jar I had made an abstract pair of cupped leaves joined at top point. It seemed a natural hollow to put a raw gem. The luscious colors that developed in the firing just screamed amber. I found this chunk of stone citrine fit beautifully in that hollow. 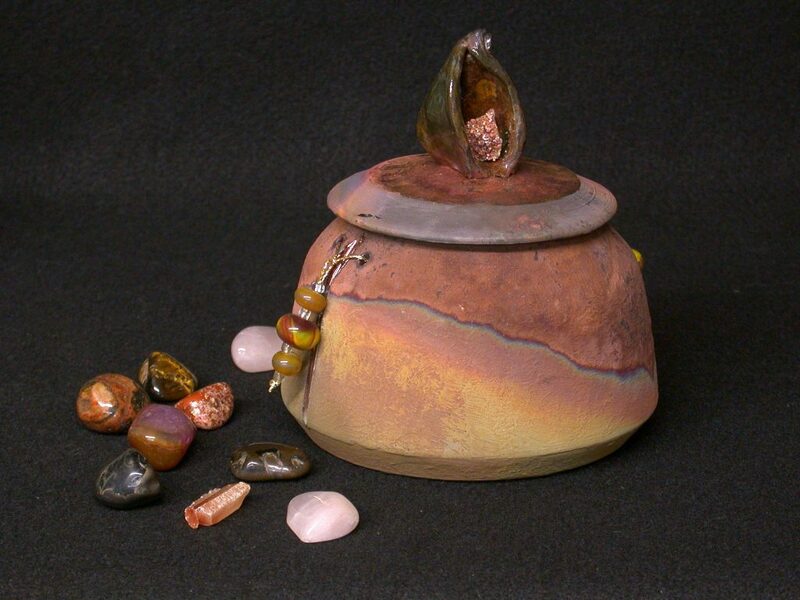 I chose amber colored lamp worked glass beads to further decorate the jar. This is my first and at the moment the only raw gem in my various artworks. The stones around the jar are included in the price.